My Occasional Blog: And They're Off! On the straightaway at a buffalo race in Jembrana. The "whip" is a studded stick drivers use to urge the animals to run faster. 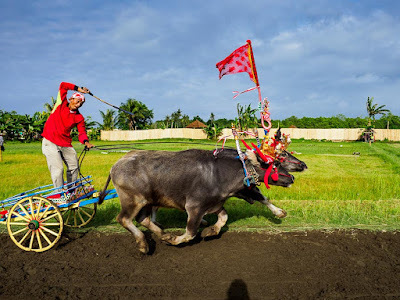 I went back to the buffalo races in Bali. The season is pretty short, from July through October. 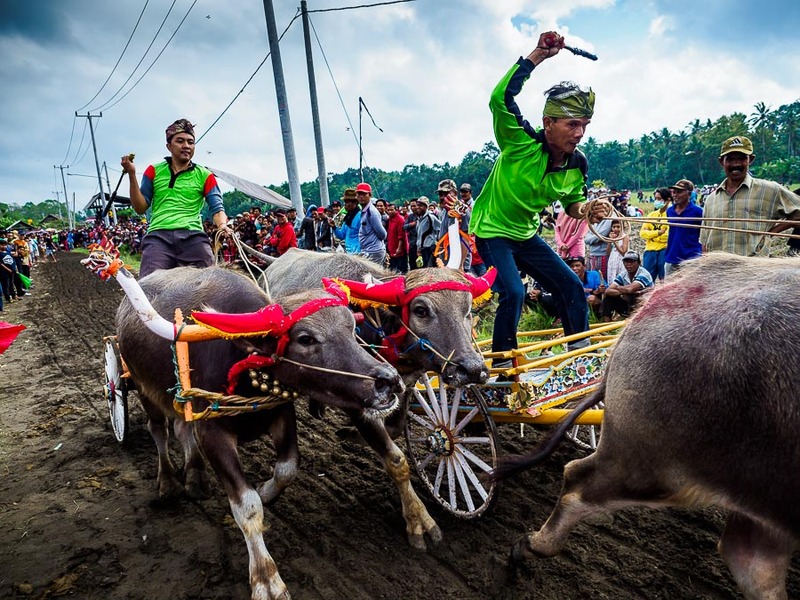 The races are held every other week and they're in out of the way locations far from the tourist centers of Ubud and Kuta/Sanur. All of which means going to the races is as much of an adventure as the actual races. This year, I was able to stop to make pictures of rice farmers and fisherman, so the trip was well worth the investment in time and money. 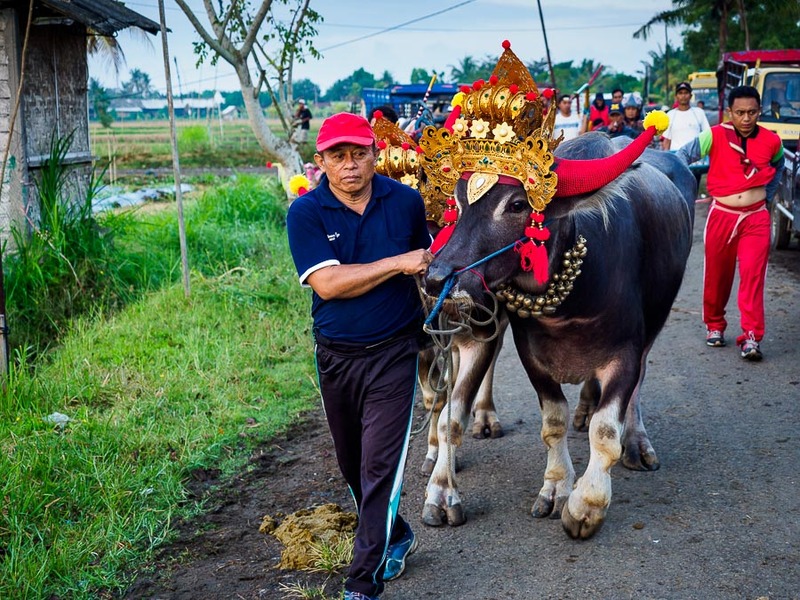 A man pulls his team of buffalo to the starting area. 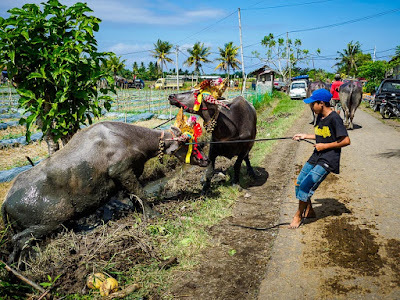 Racing water buffalo may seem like a contradiction, because they look slow and unagile. But they are surprisingly fast, even if they are unagile. 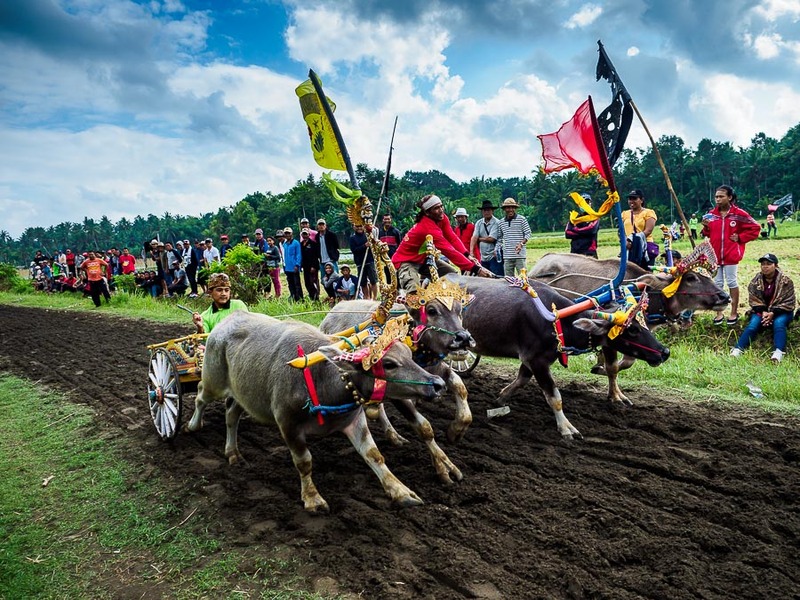 Buffalo are raced throughout Asia. 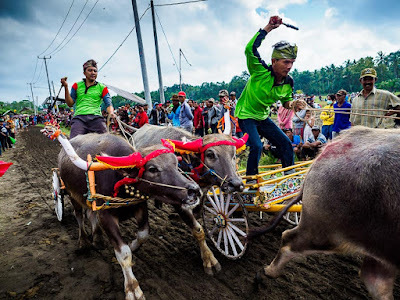 In Thailand, men ride them in the same way jockeys ride horses, in Sumatra, men ride a ski like contraption pulled by buffalo, in Java they ride plows pulled by buffalo and in Bali they ride small carts, not unlike silky, or trotter, racing in the US. A pair of racers come into the finish line. 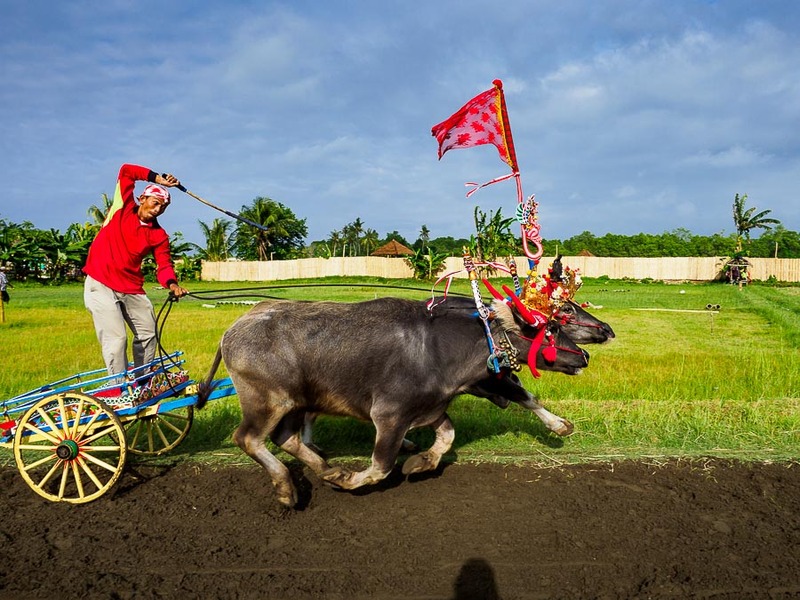 The rules for Balinese buffalo racing are kind of complicated. The winner is determined by how much distance there is between teams at the finish line. 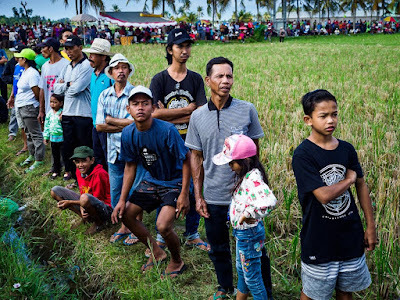 The race is held on a narrow track that winds through rice fields and racers start at the same time, but one behind the other (there are usually two teams on the track at one time, but sometimes there are three). There is a set distance between the two teams. The winner is based on whether or not the distance changes at the end of the race. If the first time pulls further ahead by the finish line, it wins. If the second team (or third team) closes the gap, it wins. If one team passes another, a gutsy move since the course is barely wide enough for two teams to pass, it wins with a roar of approval. Spectators stand in a rice field and watch the races. It's when there's a third team on the course that things get really interesting. The course is an unpaved road that, every other day of the year, is used by people going about their daily lives. The races are a mere diversion and people, even on race day, use the road to get from point A to point B, though thankfully only on foot (motorbikes and not allowed on the course on race day). People clear off the road when they hear the carts coming and then get back on the road after the second cart passes. It's when there's a third cart, bringing up the rear, that things get "interesting." Locals are smart enough to look before running back onto the road, but tourists not so much. I didn't see anyone get hit, but I did see a couple of close calls as people wandered back onto the road to get to a better vantage point, only to realize at the last minute that were still buff on the course. A cart speeds down the track. Complicating the scoring is that races are not only between individual teams, but also between communities. Communities have their own flags, red (first photo) and green (above). The final winning community is based on a cumulative score drawn from that day's races, with more importance given to the last races of the day, run by each community's best teams. 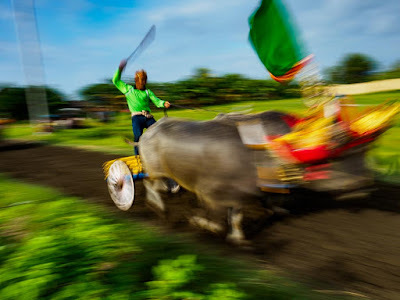 It's a complicated way to figure out who has the fastest water buffalo. The buffalo wear ornate headdresses. It's worth going to the races if you are in Bali on a race weekend (every other Sunday July - October) and you can figure out where they are and you can arrange transportation up to Jembrana. 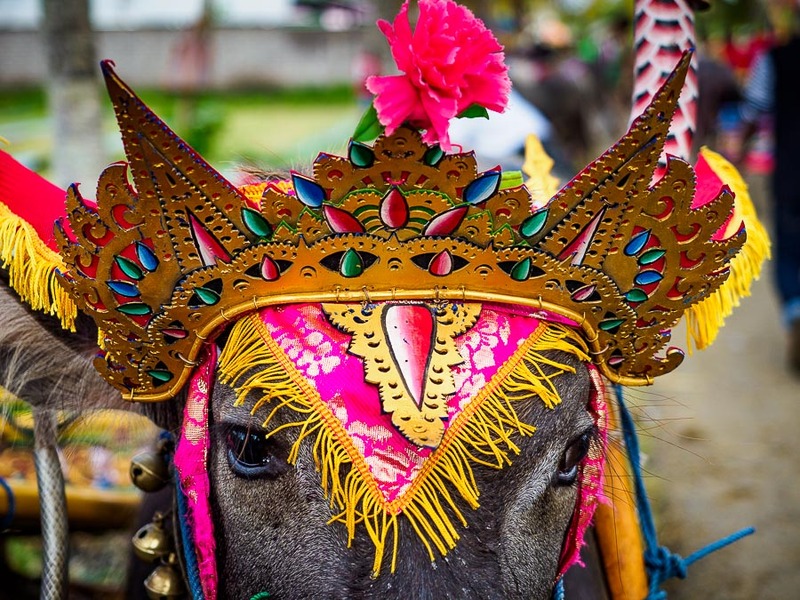 In addition to the races, you will see slices of island life that foreigners don't often see. Vying for position at the finish. There are more photos of buffalo racing in my archive. A boy pulls his buffalo out of an irrigation ditch they lumbered into after the race.